<?/x-tad-bigger><?x-tad-bigger>What they say:<?/x-tad-bigger><?x-tad-bigger> A tempting whirl of passionfruit, mangos, strawberries, peaches, lower calorie dairy base and ice. <?/x-tad-bigger><?x-tad-bigger>What we say: <?/x-tad-bigger><?x-tad-bigger> We were excited about this one based on the description, but we're not gonna lie, it was slightly disappointing and very sour. Is there a chance that with sweeter fruit it would have been better? Sure. But we didn't take any chances, we added a packet of Splenda to it, and immediately the taste improved by 25%. This one was definitely more icy than creamy. <?/x-tad-bigger><?x-tad-bigger>Overall score:<?/x-tad-bigger><?x-tad-bigger> 7. It was our least favorite. <?/x-tad-bigger><?x-tad-bigger>What they say:<?/x-tad-bigger><?x-tad-bigger> The much-celebrated karma of fresh strawberries and bananas come together here with apple-strawberry juice and our lower calorie dairy base. A heavenly way to get your B6 fix which ensures your nervous system’s peak performance! <?/x-tad-bigger><?x-tad-bigger>What we say: <?/x-tad-bigger><?x-tad-bigger>This one was AWESOME. It was super-creamy, sweet, and had the perfect blend of berries and bananas. You would have absolutely no idea that this beverage was lower-cal or low-fat in any way. It wasn't as slushie or icy as some of the others so the texture was better, too. <BR><BR><STRONG>Overall score:</STRONG> A perfect 10. Bravo!</div></TD> <TD width=20></TD> <TD vAlign=top align=left><table align="left" cellpadding="0" cellspacing="0" border="0"><tr><td align="left"><IMG src="http://www.hungry-girl.com/sectionimg/1775jamba2.jpg" vspace=5 alt=""></td></tr></table></TD> <TD width=20></TD></TR> <TR> <TD colSpan=5 height=20></TD></TR></TBODY></TABLE></TD></TR><TR bgColor="#b2e7f4"> <TD vAlign=top width="100%" colSpan=2> <TABLE cellSpacing=0 cellPadding=0 width="100%" border=0> <TBODY> <TR> <TD colSpan=5 height=15></TD></TR> <TR bgColor="#b2e7f4"> <TD width=20></TD> <TD vAlign=top align=right><table align="right" cellpadding="0" cellspacing="0" border="0"><tr><td align="left"><IMG src="http://www.hungry-girl.com/sectionimg/1776jambamango2.jpg" vspace=5 alt=""></td></tr></table></TD> <TD width=10></TD> <TD vAlign=top style=" COLOR: #000000; FONT-SIZE: 13px; FONT-FAMILY: Palatino Linotype, Georgia, Times New Roman; LINE-HEIGHT: 18px;"><div><SPAN style=" FONT-WEIGHT: bold; COLOR: #000000; LINE-HEIGHT: 18px;">Mango Mantra</SPAN><BR> <BR><STRONG><EM>(16 oz. - 170 calories, 0.5g fat, 230mg sodium, 36g carbs, 2g fiber, 32g sugars, 7g protein = 3 Points)</EM></STRONG><BR><?/x-tad-bigger><B><?x-tad-bigger> <BR>What they say:<?/x-tad-bigger></B><?x-tad-bigger> Seeking enlightenment? Here’s a mantra to live by... a blend of mangos and peaches with 100% pure orange juice and our delicious lower calorie dairy base. Mangos are a renowned source of vitamin A, which is essential for immunity and healthy cells, especially eyes, skin, and hair.<BR> <BR><?/x-tad-bigger><B><?x-tad-bigger>What we say: <?/x-tad-bigger></B><?x-tad-bigger>This one tasted like frozen orange juice with mango and it was actually pretty yummy, though it was a tiny bit bland and tasted like it was lacking <?/x-tad-bigger><I><?x-tad-bigger>something <?/x-tad-bigger></I><?x-tad-bigger>(though we're not sure what). We have to admit, we added some Splenda to this one as well and that definitely helped. You can really taste and see the chunks of mango in this one, which we definitely appreciate. What they say:<?/x-tad-bigger><?x-tad-bigger> The name says it all! Berries fulfill while achieving the harmony of simple, fresh flavor. 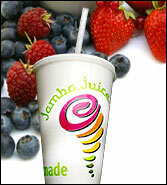 We add a mix of strawberries, raspberries, and blueberries to our lower calorie dairy base and mix in raspberry juice. The result is a lower calorie smoothie filled with vitamin C as well as iron, which keeps your blood healthy and happy. <?/x-tad-bigger><?x-tad-bigger>What we say: <?/x-tad-bigger><?x-tad-bigger>This one was SUPER thick. It was bursting with awesome berry flavor – and you could actually taste each individual kind of berry (really!) – strawberries, raspberries, and blueberries. We loved this one – it tasted like a decadent dessert. Bravo! 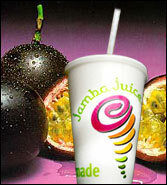 Jamba Juice was founded by a cyclist named Kirk Perron in 1990, and was originally called "Juice Club". Now, 16 years later, there are over 500 stores. Share this Jamba-rific email with people who like to drink blended things. Click "send to a friend" NOW!!! !